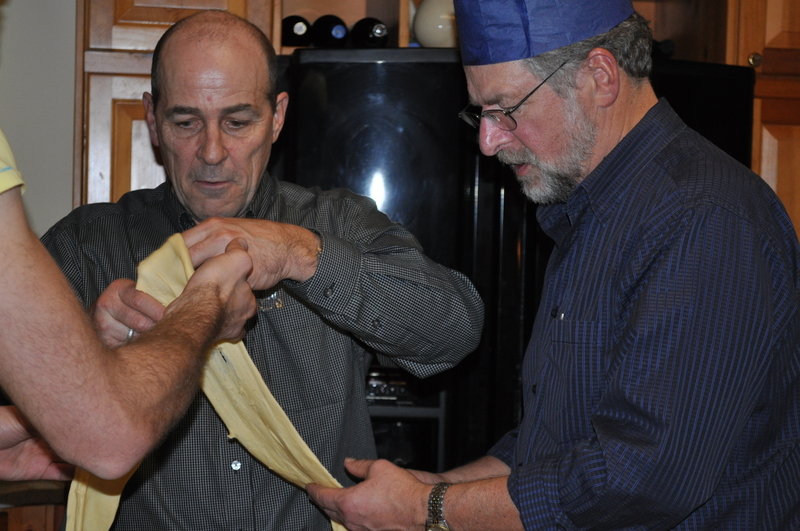 Denis and I learned to make pasta this summer while staying at Alla Madonna del Piatto in Assissi, Italy. Our bed and breakfast hostess, and cooking instructor Letizia, led us through the steps and we have had a great time experimenting with different types of pasta ever since. Letizia’s blog is a terrific resource for authentic Umbrian cuisine. I suggest you read through her recipe for egg pasta dough if you are a pasta “newbie”. It is important to use the correct flour. Type 00 Farina di Grano flour is available in Italian specialty shops here in Canada. As only enriched flour is allowed to be sold in Canadian grocery stores, you won’t find it there. Make one batch of egg pasta dough by mixing 1 1/2 cups of Type 00 flour with 2 eggs in a food processor. Wrap tightly in plastic wrap and let the dough rest for up to an hour. 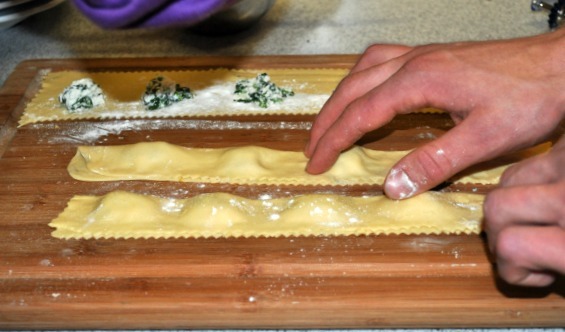 Using a pasta machine, roll out pasta into sheets and fill with spinach-ricotta mixture. Cook for about 5-7 minutes in rapidly boiling salted water until al dente. Wilt a handful of freshly washed spinach (stems removed) in a skillet, chop finely. Stir into 1/2 cup ricotta cheese. Here I’ve adapted one of Letizia’s recipes to suit my family’s tastes. 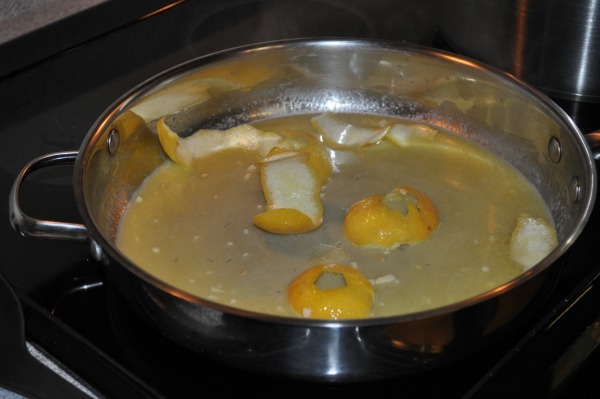 Melt butter with lemon juice and lemon zest in a skillet. Add garlic. Just before the pasta is ready, add cream, parmesan cheese and a spoonful or two of the pasta water. Do not cook; remove from heat. Drain the pasta, add to the skillet, and toss gently. Garnish with fresh basil, drizzle with a few drops of basil infused olive oil and serve immediately. 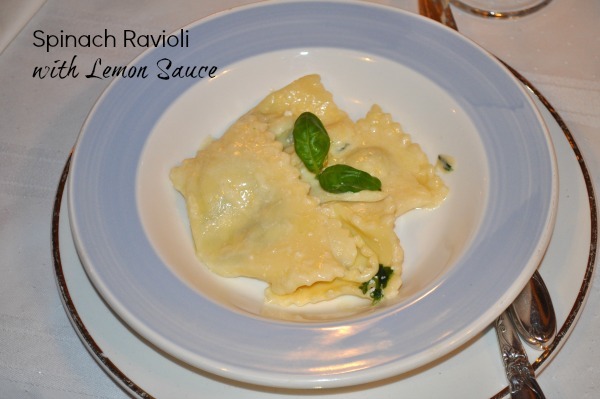 This entry was posted in pasta and tagged lemon, ravioli, ricotta, spinach. Bookmark the permalink. thank you so much for posting this, I am so happy you enjoy making the ravioli, as you know it’s my favorite recipe! We have such fond memories of our time in Assissi at Alla Madonna del Piatta. It was certainly one of the highlights of our summer in Europe. Panna cotta has become a family favourite too!